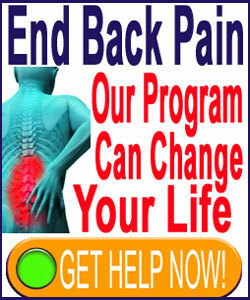 The lumbar spine, also called the lower back, is one of the most important regions of the human vertebral column. The lumbar zone provides an incredible degree of movement for the anatomy, supports a tremendous amount of weight while simultaneously enduring continuous stress, and facilitates neurological communication between the entire lower body and the brain. The lumbar region is also primarily adapted to facilitate an upright posture that separates humans from our evolutionary ancestors. Unfortunately, all these abilities subject the lumbar spinal region to dramatic degeneration and susceptibility to injury. This is the area of the backbone that deteriorates first and most significantly, with most people demonstrating structural changes by the age of 30. On a positive note, most of the changes that occur in the lumbar zone are innocent and not inherently painful. However, some structural alterations can become pathological and injury is always the perfect instigator for pain. This research section provides a background on the anatomy of the lumbar region of the human spine. We will detail the main structures that comprise the lumbar zone, as well as provide explanation on the processes that might possibly lead to lower back pain. The lumbar region stretches from the thoracolumbar intervertebral level (T12/L1) through the lumbosacral intervertebral level (L5/S1). The region contains a total of 5 independent vertebral bones and 5 intervertebral disc spacers located between each vertebra. 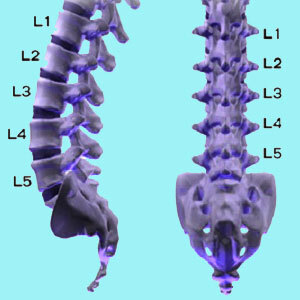 It should be noted that the region between L4 and S1 suffers the most degeneration of any area of the human spine. The spinal cord travels through the central vertebral canal, which also contains a variety of membranes and cerebral spinal fluid. The spinal cord typically ends around L1 or L2 and divides up into the cauda equina. These are the nerve roots that will exit from the spine at each lumbar, sacral and coccygeal level. The nerve roots begin their descent down the spinal column en masse and slowly thin out in number, which is why they are called cauda equina, since they resemble a horse’s tail. Each nerve root exits the vertebral column through an opening that has various names. Some of the most common names include all of the following terms: foramen, neural foramen, neuroforamen, foraminal openings, intervertebral foramina and foraminal spaces. These openings are merely gaps in between the vertebra bones that are bordered anteriorly by the vertebral body and posteriorly by the articular processes that comprise the facet joints. The sciatic nerve does not directly join into the lumbar spine, but is formed by nerve rots from 5 lumbar and sacral levels. This largest of all nerves factors into many lower body pain syndromes. The cauda equina is a mass of nerve roots that separate off from the spine at the top of the lumbar region and then exit the backbone to form a complex and extensive network of peripheral nerve tissues throughout the lower body. The 5 lumbar vertebrae are large and strong, capable of providing incredible functionality and durability to the anatomy. The 5 lumbar spinal discs virtually always desiccate first and to the most clinically significant degree of all of the spinal intervertebral tissues. The lower back muscles are unbelievably strong and provide support for the lumbar vertebral column throughout an extensive range of motion. These postural muscles rarely get a moment of rest while we are awake. Transitional vertebra describes a condition wherein the individual demonstrates one or more extra lumbar vertebra, commonly named L6. A large percentage of lumbar back pain conditions are blamed on completely normal and innocuous aging of the lower spine. This is a medical travesty. Degeneration of the structural spine can become pathological in rare cases, but these circumstances represent the gross exceptions to the rule. The lumbar region is durable and fully capable of providing proper form and function for life. Although represented in modern medical propaganda as deficient, unstable and prone to injury, the lumbar zone has made us the preeminent species on this planet and served our ancestors well for millennia. There is no reason to doubt or demonize it now.